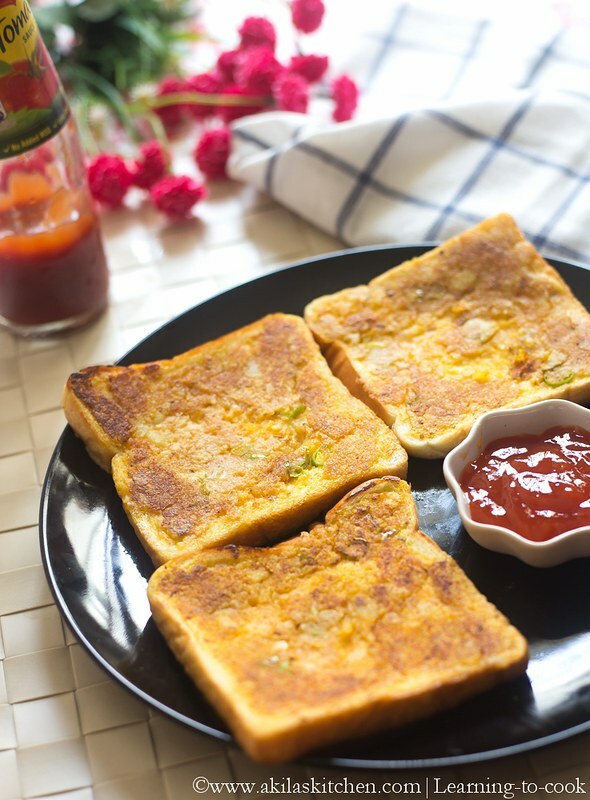 Potato toast or the Aloo toast is yet another simple bread toast recipe to try when you feel lazy to cook 😜. In my Bread Pizza recipe I told that I didn’t get a piece at all and so for me and my mom I prepared this Aloo Toast which I have bookmarked from Padhu long before. I made this one a bit spicy to suit my taste and it really tastes good and my mom loved it and asked the recipe to try later 😜. Now let’s go to the easy recipe of Potato Toast. 1. Boil the potato and smash it nicely. Now add all the ingredients except bread and butter. 2. Mix them nicely. It should be Ina spreadable consistency. If not sprinkle little water. 3. 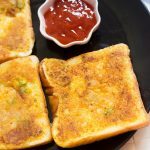 Spread the potato masala on one side of the bread. 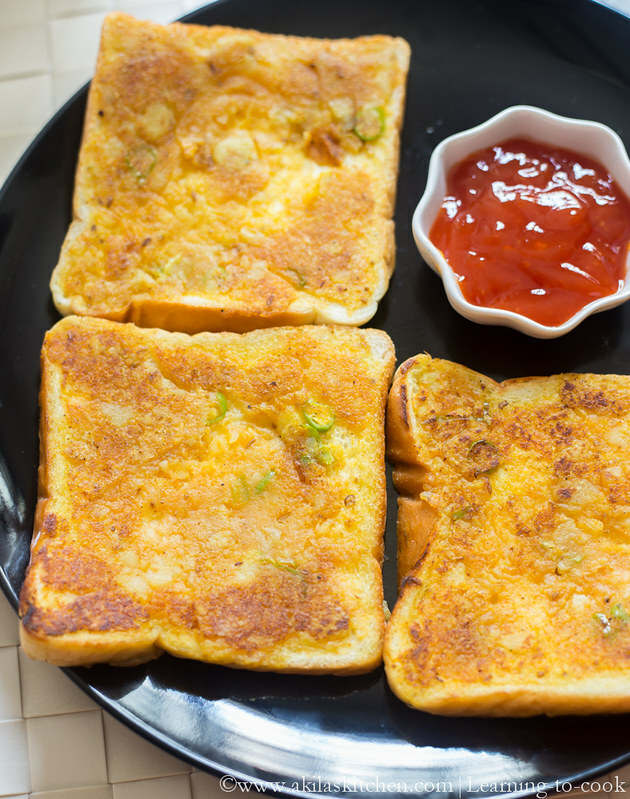 In a tawa or pan, add ghee and start toasting the normal side and toast it first. Add little ghee on the masala spreaded side of the toast. 4. Flip the bread and toast it again till it gets nicely toasted. It should take roughly 3 to 4 min. You can slowly flip and check if it has become light brown. 5. Serve it hot with Chilli Tomato Sauce. 1. This would be little spicy as we add chilli powder, green chilli as well as garam masala. So while giving to kids, you can avoid the garam masala and the green chilli. 2. White or wheat bread suits to prepare this toast. Boil the potato and smash it nicely. Now add all the ingredients except bread and butter. Mix them nicely. It should be Ina spreadable consistency. If not sprinkle little water. Spread the potato masala on one side of the bread. 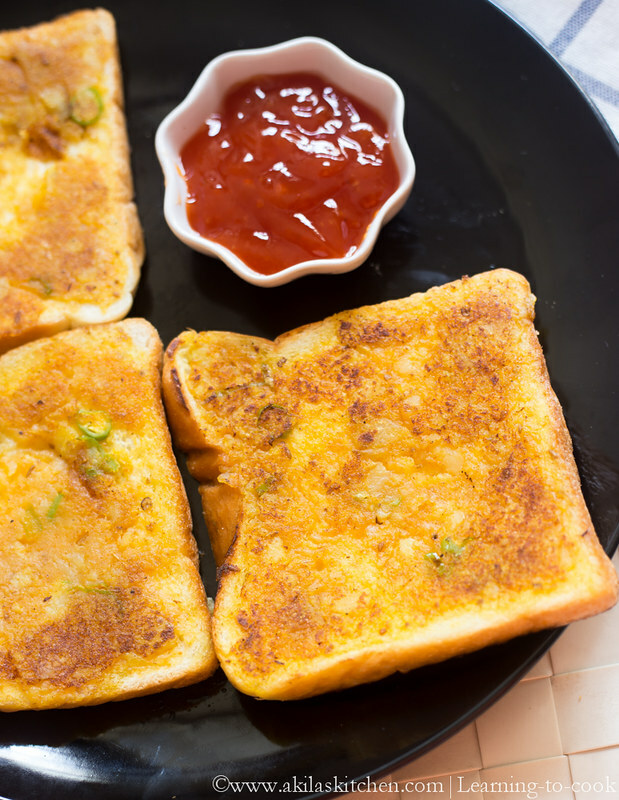 In a tawa or pan, add ghee and start toasting the normal side and toast it first. Add little ghee on the masala spreaded side of the toast. Flip the bread and toast it again till it gets nicely toasted. It should take roughly 3 to 4 min. You can slowly flip and check if it has become light brown. Serve it hot with Chilli Tomato Sauce. Wow! There will be a great breakfast for me! Thanks! Ah! I have some boiled potato in my fridge… this toast is really tempting!